For those of you fortunate enough to have some outdoor space, you have another 'room' to think about designing - your patio space! I'd love to see some of your patio spaces, is anyone willing to send in some photos that you'd like to brag about? A patio, a balcony, it doesn't matter to me, as long as you love it! Some of my CA friends (hint, hint Michelle) have some gorgeous patio areas, and I'm sure many other readers have great outdoor spaces, too. I have a massive backyard with a pond, so I guess I should step up with a few photos myself. Anyone want to help me get started? 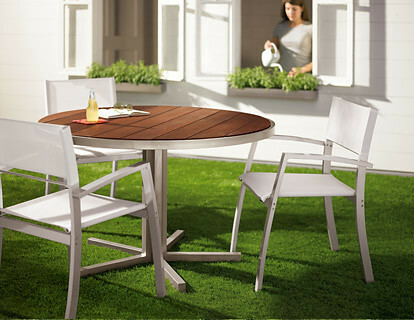 Room + Board has a great table called the Montego that I only wish I had a concrete slab to sit it on (I wouldn't want to move it everytime the lawn is cut, so I'm not sure how practical it is to place it directly on the lawn as shown in this photo. One must also be concerned with 'chair sinkage'. This occurs after consuming too much from the grill and the chair digs its way into the lawn. he he). The Montego is sleek and sophisticated, combining the warmth of wood with cool clean stainless steel. Of course, great design isn't merely about looking good, and with outdoor furniture, we often care even more about how durable it is. Since the Montego is a combination of durable stainless steel and a South American hardwood similar to teak called ipe, this patio set is also strong and weather-resistant, serving you for years to come. Let's see, strong, weather-resistant, beautiful - can we go ahead and call this is a design triple threat? Check out the coordinating Aruba chairs for only $99! Have photos of a patio area that you're proud of? Send them in!